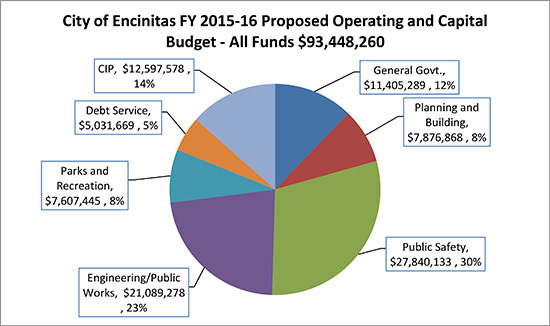 Good news — the City of Encinitas is in excellent financial shape. Sometimes a myth surfaces that Encinitas is in financial trouble. We occasionally have a speaker at city hall who accuses the city of fiscal irresponsibility, taking on too much debt or spending money it doesn’t have. Those accusations are simply unsubstantiated by the facts. The city pays about $5 million each year in total debt service, which gives us a debt ratio of 7.9 percent (debt ratio means the yearly debt service amount compared to general fund revenue). This is considered excellent. It’s every resident’s legitimate right to disagree with and try to influence what the city decides to spend its money on — whether it’s a debate about the relative value of sports fields at the Encinitas Community Park or supporting the arts community at Pacific View. But it’s inaccurate to allege that city leaders are reckless spenders or to suggest that the city is drowning in debt. Neither are true. Like you, I become outraged when reading news articles about government agencies that misuse or misappropriate tax money. I wonder how various boards or elected officials could have been asleep at the switch. I’m determined to do everything in my power to make sure fiscal mismanagement never happens on our watch. But I also understand that in order for the city’s ship to continue sailing, the City Council has to rely on the expertise of our professional staff. Ultimately the engineering department tells us when the stormwater system needs repair (which costs money), and the fire chief tells us when it’s simply not sustainable to continue running the fire station in Olivenhain using overtime pay (which also costs money). It’s important that your elected leaders fully comprehend the data, finances and statistics and that the rationale from every city department is justified. But the bottom line is that our financial condition has improved in the last three years, even with finishing the Encinitas Community Park and buying the Pacific View property. We are not drowning in debt. From what I can tell, we all carefully peruse the budget to make sure our spending is in line with your priorities. Our total yearly revenue is more than $90 million and it’s trending up. Our biggest expenditure is keeping our city safe – the salaries, benefits and capital costs associated with law enforcement, fire and marine safety. We have and support six fire stations, and we contract with the Sheriff’s Department for our police service at a total yearly cost of just under $28 million. The next biggest category, at about $21 million, is engineering and public works, which treats waste water, repairs streets, reviews development plans and builds projects. What is the source of the city’s money? Most comes from property taxes because Encinitas is essentially a bedroom community with 75 percent of our city’s acreage devoted to homes. We have more homes than jobs and many people drive outside the city to work. We have a smaller but still-important sales tax base, primarily from the businesses along El Camino Real and to a lesser extent downtown. Some of the city’s biggest sales tax generators are Target, Walmart, BMW of Encinitas, Encinitas Ford, Home Depot, Vons and gas stations. While property taxes generate 42 percent of our budget and sales taxes 13 percent, the rest comes from fees and charges, transient occupancy tax (paid by visitors at hotels), franchise taxes (paid by utility companies to use the city’s right of way), licenses and fines. We also get federal and state money generated from things such as the gasoline tax. In addition to our ongoing expenses, the City Council is considering funding the following capital projects, which are considered discretionary: 1) sidewalk and crosswalk improvements around Paul Ecke Central Elementary School, 2) a third roundabout at Leucadia and Hygeia Ave., 3) artificial turf and lights at Leo Mullen Sports Park, and 4) the streetscape project along Highway 101 in Leucadia. We are considering increasing the amount we spend on street repaving from about $2 million to $3 million a year. We also recently put extra money aside for upcoming facility repairs and pension costs. Some worry about the government’s unfunded pension liability, which is about $32 million. The unfunded pension liability is the difference between the benefits current employees have earned versus the amount of assets we have set aside with the state to pay for those benefits. We contribute about $4.4 million a year toward pensions, which is what CALPERS requires us to pay. If we make our annual contribution as required by CALPERS for 30 years, we’ll no longer have an unfunded pension liability. It’s like paying off your home mortgage in 30 years. We could pay off this unfunded liability faster, if we as a city wanted to prioritize that over other things. In fact, we contributed an additional $260,000 toward this unfunded liability at the end of last year. Prepaying this debt faster could be a future discussion topic for the Council. Responsible management of taxpayer money is a fiduciary obligation that I take very seriously. It’s a relief to have dug into the weeds and feel confident that we are well-managed and approaching our finances with discipline. 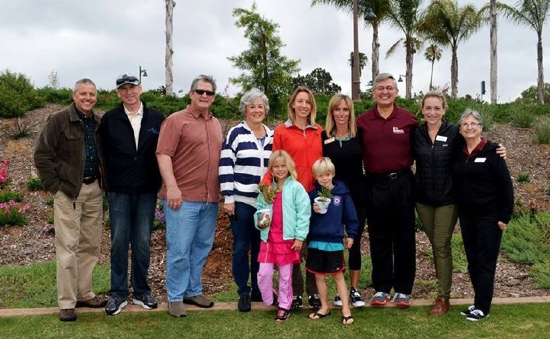 Last Saturday morning at Encinitas Arbor Day 2015. Pictured from left to right are Engineer/Public Works Department Director Glenn Pruim, Interim City Manager Larry Watt, City Council Member Tony Kranz, City Council Member Lisa Shaffer, Deputy Mayor Catherine S. Blakespear, Mayor Kristin Gaspar, San Diego County Supervisor Dave Roberts, Cardiff 101 Main Street Executive Director Tess Radmill, Cardiff 101 Main Street President Susan Hays, and in front, Ava and Oliver Blakespear.